What is a Passport Application Form? The passport application is used to get a new passport. A new passport application form is a document used in the United States when someone in that country wishes to apply for a new U.S. passport, needs to replace an expired U.S. passport for a child under the age of 16 years, or when a passport is lost. This application was updated in 2013. Create a free Passport Application Form in minutes with our professional document builder. To apply for a U.S. Passport, you’ll need to download a copy of the DS-11 Application Form. You may also be able to locate this form at the U.S. Post Office or another government office. However, you must meet some requirements if you wish to use this form. The U.S. Department of State also has an online application that you can complete. It will create a 2D barcoded application that is in PDF format for you to print. If possible, you should use a barcoded application because it’s the only type of passport applications that many acceptance agents will take. You’ve never had a U.S. passport. You were under the age of 16 years when your last U.S. passport was issued. Your most recent U.S. passport was issued to you more than 15 years ago. Your U.S. passport was lost or stolen. - Note: you should also report a lost or stolen passport to prevent identity theft. Your name has changed since you received your last U.S. passport and you cannot legally document your name change. 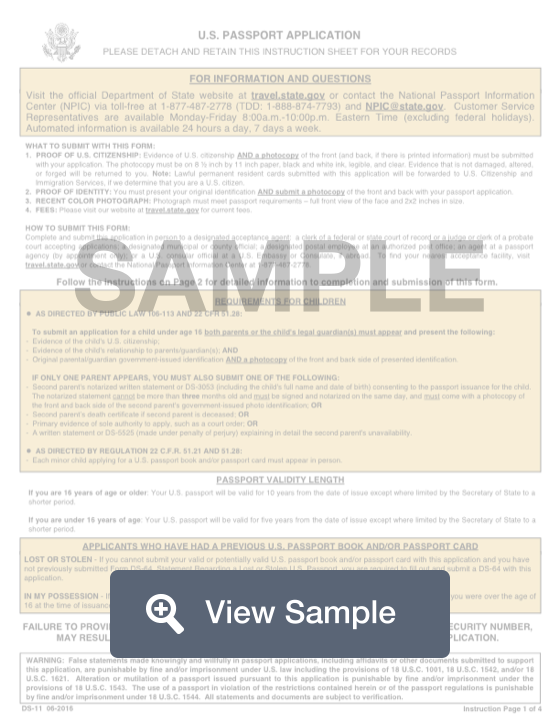 Note: Do not use this passport form if you are simply renewing an adult's passport. For passport renewal, you would instead use Form DS-82 to renew your passport by mail. If you are changing your name within one year, correcting a passport error, or replacing a limited validity passport within one or two years, you would use Form DS-5504 instead. 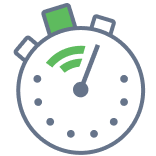 Once you have completed your U.S. passport application, passport issuance takes between four and six weeks unless you use the expedited service. Expedited passport services takes about three weeks. If you are only planning on traveling via land or sea to Canada, Mexico, The Caribbean, or Bermuda, you may want to consider applying for a U.S. Passport Card instead of a passport book. A passport card is a wallet sized card that is Real ID compliant and can be used for domestic air travel. It cannot be used for international air travel. Both a passport card and a passport book serve as evidence of U.S. Citizenship.